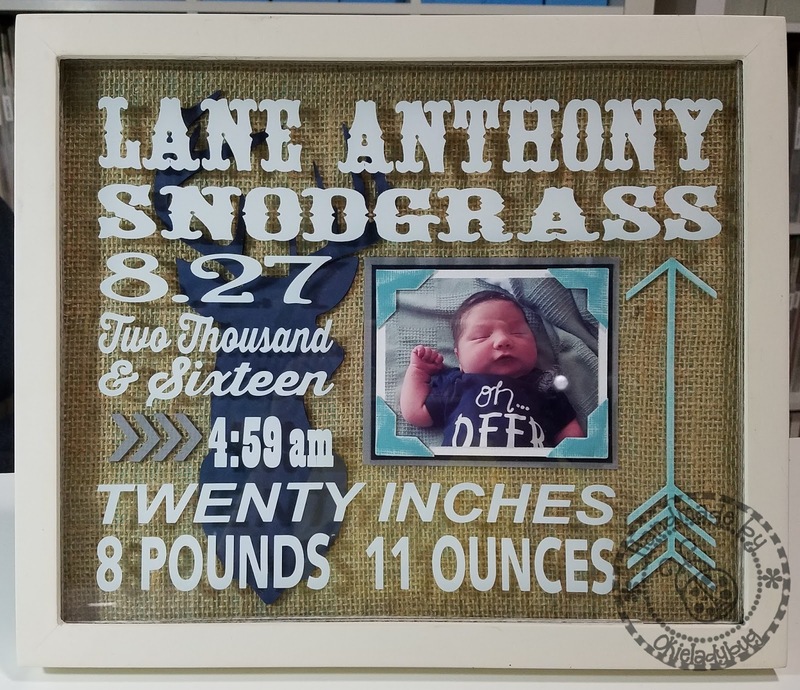 I have seen a lot of the "baby frame" ideas and while I have plenty of canvas and a few frames around when I got ready to make one I wanted it to be a little more than just the name, date of birth and other birth information so I got a little inventive. Remember the shadow box frame I showed a few days ago and I said I had a few more of them? Well I broke another one out for this project. If the store would have had 20 of these I would have bought them all but I think I actually only ended up with like 5 or 6. I think I ended up spending about 80 cents or so on each one as they were like 90 percent off. Anyway, back to the frame. My niece had her baby Saturday morning and by morning I mean like EARLY! My daughter and I had went up on Friday and stayed until about 10:30 that night and since my niece wasn't progressing I decided we would go ahead and go home. If I had thought to take a contact case, some solution and my glasses we would have waited it out but I really thought it was going to go faster than that, but there is no rushing things when it comes to birthing them babies! Well dang, okay now about the frame *okie so hates the squirrels that tend to run her life*. Like I said I love the idea of the frames but I wanted it a bit more personal so I got information from my other niece, Amber, and her mother, Teresa *okie would say her cousin but then would have to explain about why her nieces mother is her cousin and thinks that needs a post of it's own* about what Marissa was going to have for the decorations of Lane's room. After they sent me a few pictures I had a good idea about what to do in the frame and what colors to use. Amber was good enough to send me pictures of Lane and didn't even complain when I told her "okay now I need one of him by himself". I knew I needed a deer, some chevron and an arrow and I wanted to add a picture of Lane to the frame to make it more personal than just the information so I got into MTC and played around with a few things and once I got my pieces that I wanted I started finding different fonts for the information. Since the deer head was going to be large I knew I could put it in the background and allow lettering to cover it but I needed open space for the other items. Once I got the all the elements in place I moved and resized the information to make it fit where I wanted *okie so loves Make The Cut* and it was rather easy to do. Once again I used some burlap for the background *okie wonders if everyone has pieces of burlap laying around like she does* because on this particular frame it just went nicely with the elements. In order to get the pieces to stick to the burlap I use some Sobo glue and guys if you haven't tried this stuff let me tell ya it is beyond A-MAZE-ING! I cut the vinyl in mirror image format so I could put it on the back of the glass, this makes for easier dusting and protects the vinyl a bit more as well. I did make registration marks to make placing the vinyl easier and then just pulled them up after I got the vinyl in place. My niece was very pleased with the frame and even posted it on Facebook to show it off. I'll post the other gift I made her tomorrow. Love it, like the font and the photo corners. Love, love, LOVE! 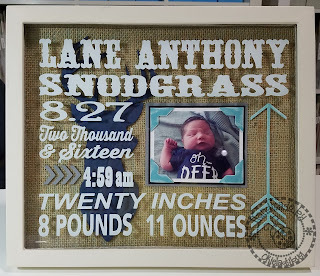 Great job on this baby frame, Shirley. Love the design and the great fonts too. What a beautiful forever after keepsake gift for your niece. I don't blame your niece of posting it on FB, I would have done the same ... it's awesome! Really this is darling. What a great design job!! Very, very nice! Such a great gift idea!